The fifth release from Bristol based electronic label Durkle Disco sees them step away from their dance floor charged roots, and deliver a double header of cerebral, post-dubstep epics. 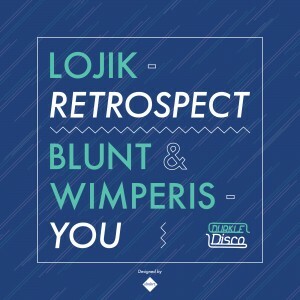 ‘Retrospect’ is the latest emotive release from Lojik, a producer backed by Annie Mac and featured on Phaeleh’s FabricLive mix. He has created a musically lush post-garage lullaby, with a question that warrants its title. Inhabiting a space rarely touched upon in modern electronic music, ‘Retrospect’ would suit an iPod assisted bus journey as much as your club issue Funktion 1 rig. Soothing piano and searing string arrangements through the later of this cerebral journey evoke euphoria and solemness equally. ‘You’ is the first offering from newly formed production partnership Blunt & Wimperis. Blunt originally found success through a steady involvement with the north west UK grime scene, in particular gaining acclaim for his part in Central Spillz member C-Strike-Z’s 2008 album ‘It’s Never Simple’. After a self imposed hiatus, ‘You’ came about after a chance meeting with self taught FX expert and guitarist Wimperis. Over a series of studio sessions, they built an autumnal arrangement, bustling with percussive variation, built around a foreboding vocal sample. This stab permeates the whole of the songs progressive landscape through surging, dub slanted bass and innovative spectral routing.